-Drool. 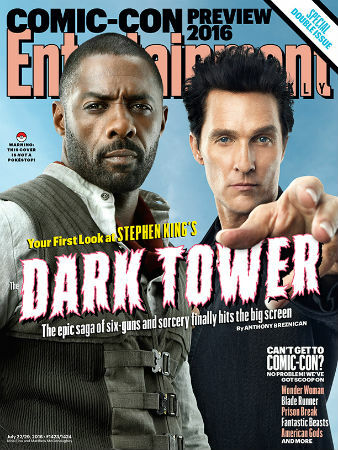 Idris Elba is on the cover of EW to promote Stephen King‘s Dark Tower. Oh, Matthew McCoanaughey is there too, I guess. -Speaking of McConaughey, this little girl recreated his car commercial in Barbie Jeep. Bless her. -The Wire’s Michael K. Williams was a backup dancer for Ginuwine, which makes me ridiculously happy. –Gwyneth Paltrow was at a makeup event at a store in my hood, and I got a glimpse of her (and a very blurry photo) when she and her burly security guard were leaving. Is this what it feels like to catch a Pokemon? -Meanwhile, Gwyneth and Chris Martin are finally officially divorced consciously uncoupled. -Another day, another article about how the Taylor Swift–Tom Hiddleston relationship could just be a giant hoax. Meanwhile, a source close to Swift insists they’re real and they’re spectacular. -MTV’s ‘delete your account’ column continues to be a thing of beauty. This week’s target: Calvin Harris. –Fred Savage would make a *great* cohost for Live. He was a total charmbomb when promoting The Grinder. -41-year-old Leonardo DiCaprio was photographed kissing a 24-year-old model. That’s swell. –Mick Jagger is about to have his eighth(!) child. -Ghostbusters opened strong last night! I’m crossing all my fingers and toes that this movie passed the $50M mark this weekend (and am taking a gaggle of gals with me tonight to do our part). –Hailee Steinfeld is over being a teenager with Woody Harrelson as her teacher in the redband trailer for The Edge of Seventeen. -The entire world is freaking out over the Star Wars: Rogue One sizzle reel that was released today.